Care homes have a legal obligation to make sure that they adhere to the Regulatory Reform (Fire Safety) Order 2005, ensuring the safety of their residents and to prevent the spread of fire. One of the measures that care homes must implement is the compartmentalisation of areas, installing fire doors to prevent a fire from raging through a building, trapping vulnerable people inside. Fire doors, however, are heavy and fitted with an automatic closing device to ensure that the door is closed should a fire break out. Whilst an absolute necessity in ensuring that vulnerable residents are protected from a fire, fire doors can pose a hindrance when it comes to the mobility of residents, which can in turn impact on the mental wellbeing and general health of individuals. The Mental Health Foundation state in their booklet ‘How to look after mental health in later life‘ that physical activity and exercise can boost self-esteem and confidence as well as promote good sleep. Research and studies have shown that promoting mobility of the elderly and facilitating their control over the decisions they make have a positive impact on their self-esteem, which in turn can influence mental health as well as general health. Something as simple as improving the independent mobility of residents within the care setting can have a big impact. With the number of people over the age of 85 doubling in the last three years (Making health care systems fit ageing population) promoting the physical and mental wellbeing of our ageing population is a must. How then can care homes achieve this and still adhere to the Regulatory Reform (Fire Safety) Order 2005? Installing a fire door retainer, such as the Dorgard or Freedor, on a fire door will ensure that the heavy and cumbersome fire door is held open allowing free movement of residents. Dorgard and Freedor listen for the sound of the fire alarm and on hearing the alarm, the unit will activate enabling the fire door to close, ensuring that the spread of fire is hindered as far as possible. The Dorgard is fitted to the bottom of the fire door and works in tandem with your fire door closer. The rubber foot is pushed down on to the floor, keeping the door open at any angle. In the event of a fire the Dorgard will react to the sound of the fire alarm and automatically lift the rubber foot. The door closer fitted to the top of the door can then do its job and close the fire door firmly into the door frame, compartmentalising the area. Freedor is a wireless free-swing door closer. This device, in essence, takes the weight out of your fire door, enabling the fire door to stand open at any angle and react in the way a standard door does when pushed. There is no need to install a door closer along with this unit. On hearing the sound of the alarm system, the Freedor will switch on its integrated door closer and shut the fire door. 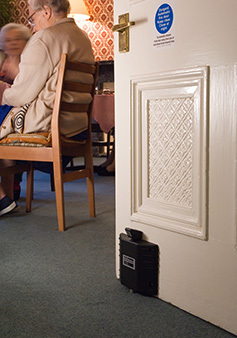 Fitting Dorgards or Freedors to your fire doors is of great benefit to both caring staff and residents. Enquire today and make that change.